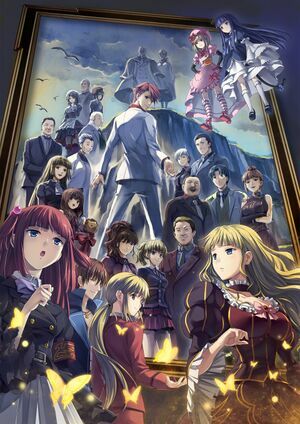 The cover of Twilight of the Golden Witch, the second complete release the Umineko games, which consists of the four games of When They Cry 4. Umineko no Naku Koro ni Chiru (うみねこのなく頃に散, Umineko no Naku Koro ni Chiru?, lit. When the Seagulls Cry Breakdown) is a Japanese murder mystery dōjin soft visual novel series written by Ryukishi07 and produced by 07th Expansion. The games focus on the second half of the Umineko no Naku Koro ni story and begin to delve into the core of the mystery. These games are not simply solutions to the first four arcs, but also continue the story, shifting it into new terrain. However, as the core of the series is approached, several clues to the first four arcs are revealed along the way. The game was re-released by Alchemist under the name Umineko no Naku Koro ni ~Shinjitsu to Genso no Nocturne~ (うみねこのなく頃に散 ～真実と幻想の夜想曲～, Umineko no Naku Koro ni ~Nocturne of Truth and Illusions~?) with updated graphics on December 15th, 2011. This page was last edited on 12 May 2017, at 20:29.